Have I mentioned recently how much I love Lo Scarabeo’s Samurai Tarot? Popping out of my deck today came two cards, clinging to each other: the Five of Swords and the reversed Three of Cups. Not only are these two cards clinging to each other, but they have the same colors, shades of blue and white and brown. 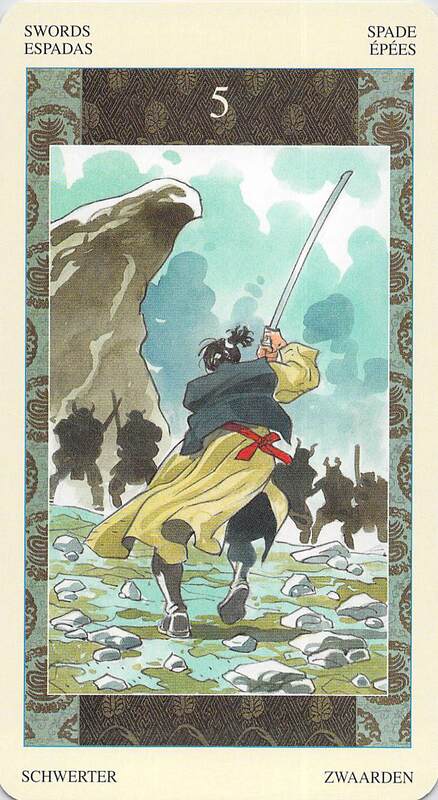 The samurai on the Five of Swords card stands upon ground as rocky as the rocks at Futimagaura (the wedded rocks of Japan, connected by a strong rope, shown on the Three of Cups card). 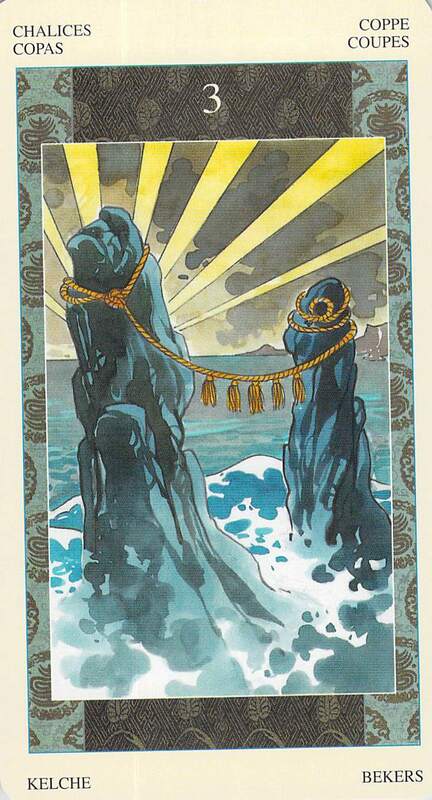 Though the Three of Cups card today appears reversed, indicating unhappiness (the sun is at the bottom of the card now) and emotional tumult (a stormy sea now at the top of the card), the rocks remain steady, grounded, unmoved. Now, I’m sure you’re thinking, “of course the rocks aren’t moving, Bonnie, they are rocks.” Yes. But if you know my love of rocks and crystals, then you’ll also know that what I’m about to say has to do with what we can learn from these rocks. Yes. Learn. From. Rocks. What can we learn from rocks? What the samurai on the Five of Swords card needs. He is outnumbered, badly. To go on and keep fighting will take all he has. The Samurai Tarot book comments, “When the sword is broken, attack with the hands, and if these are wounded use your teeth. This is courage.” To access this courage, we must first have calm: the calm of a rock. In each of us we have the ability to be a rock, to be a tree, to be different kinds of animals. We have those energies, because in other lives, or in lives to come, we were rocks, trees, insects, animals. The energetic imprint of those lives still remains with us, and we can learn from those times. We have all the calm of rock in us. We can reach that calm by grounding and connecting with the earth, or we can hold rocks or crystals in our hands, or spend time in rocky places, near mountains. All of this can help us to bring that calm, grounded earth energy to bear on any situation, even the situations in which we feel we are outnumbered, surrounded, and sure to lose. To fight for all you are worth, ironically since such a fight requires constant motion, we must have the nature of a rock. Calm. Unmoving. Still. On some level. What fight are you facing that requires you to fight with all you are worth? What fight requires you to be at your peak performance? What fight requires your total focused concentration honed to laserlike accuracy? This fight also requires you to take time for stillness, to learn from rocks, and to find a way to still the stormy waters of your emotions. The water of emotions and intuition is irreplaceable, it brings us needed information, but for the wisdom to act and the courage to act, we must turn to the element of rock and earth. We have to stop sending our spirits everywhere, all around the world, in search of information, and bring them right back into our very bodies, to stay there as if we were stone, so that we can be present for the situations that require us to be present and fully accounted for. Don’t flee your world, be IN it with firm calmness. Claim the present moment and fight for all you are worth. Don’t sit out the fight you are needed in just because you are dissociated and anxious. Just come down to earth so you can deal with it. Rocks will show you the way.